The club decided to go back to "To the Strongest" this week with some heavy Saxon on Gaul action. It gave me the impetus to finally finish upgrading my movement trays for the game. 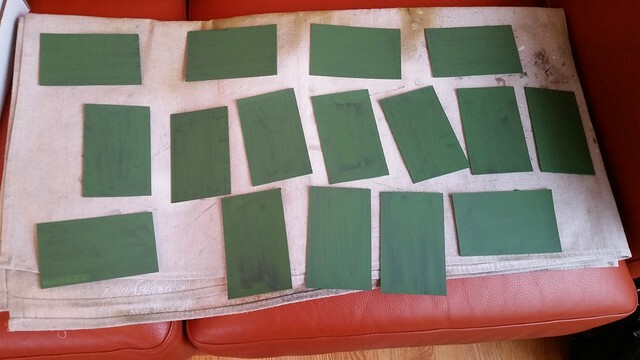 The trays themselves are heavy sheet magnet painted green. These are sized for a frontage of 3 stands each 40mm wide. Depths are for two ranks for regular troops, one rank for lights. These are mostly for "deep" units that are based on 30mm deep stands (versus normal infantry on 15 or 20mm deep stands). 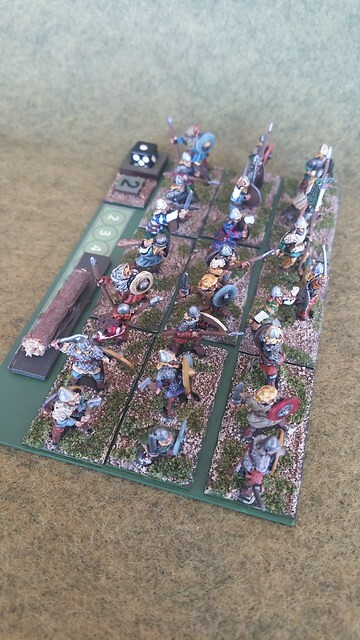 I use the magnet that is lined with vinyl on one side, as it "slides" across the table so you don't always have to lift the troops (handy with troops in the middle of a larger table). And since I base all my troops on steel bases, they stick to the tray even on hills. On the back edge is a dice dock with a unit ID. The unit ID is color coded so each command is a separate color. The number then corresponds to the number on the roster, so you know your unit 4 is Warrior, or Light Infantry, Bow (or whatever). 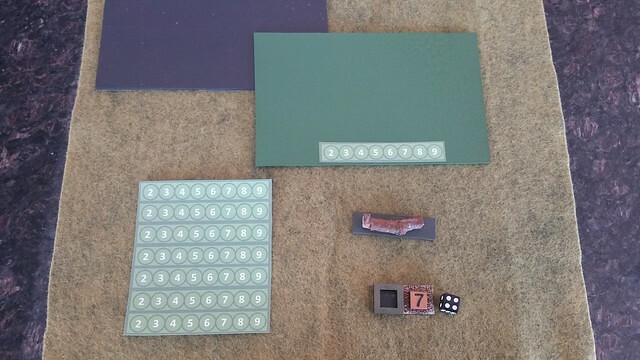 The dice is used to record ammunition level. These are removable and magnetic so they stick to the movement tray. 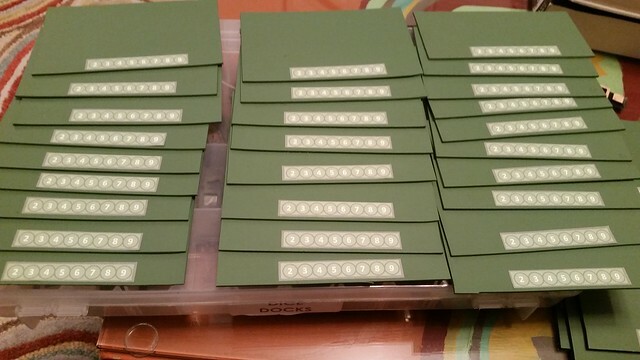 Finally there is a printed track from 2 to 9 to record activation numbers. A log "slider" is moved during the game to show what activation number was last scored. This gets rid of having all the playing cards on the table. The flexibility of basing figures on steel and using sheet magnet for various groupings is why I'm such a big proponent of it! What's your source for heavy sheet magnet? The stuff i use is very stiff and approx. 2mm thick. Here are the components of a movement stand. 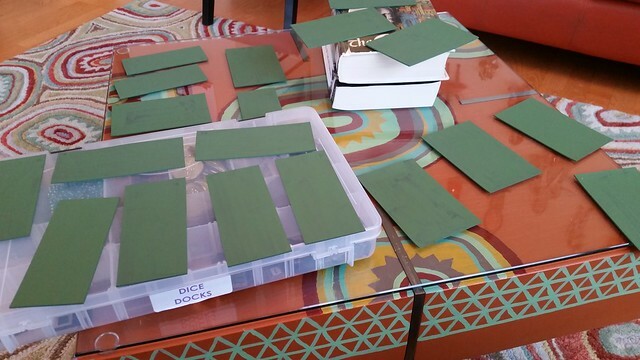 Sheet magnet (before and after painting), a unit ID/dice dock and the "slider." 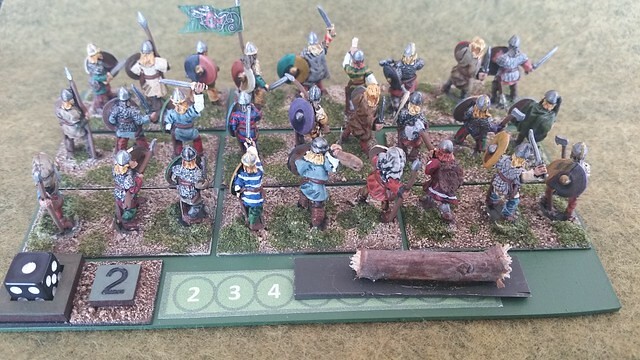 Here is a picture of the stand with my Vikings on it. In our club we use one rank of figures per "hit" the unit can take. It's a visual way to show light, regular and deep units. And here's a picture from the rear. the log is just a handle for the slider so you can move it to show the last activation card drawn. This unit last activated on a 4. I really like that! I'd be tempted to use a casualty mini on the slider. Any chance you could share the slider? The "Slider" is a small piece of sheet magnet with a twig glued to it. A casualty marker would be hard to "grab." You need to get a bit of grip and when in a scrum in the middle of the table, the twig works great. Surprisingly, I've gotten a load of emails and comments asking for details so I'm going to do a start to finish video on making these – should have it done by the weekend.